An ultra classic Swedish dish, one of my personal favorites and an absolute legend on the Swedish Christmas table. Say hello to Janssons Frestelse - Janssons Temptation. This lovely fella is essentially a potato gratin, topped with crispy breadcrumbs, soft on the inside and spiced up with small pickled sprats to add an amazing and almost undefinable sweet saltiness to the dish. But don't be alarmed by the sprat thing. It doesn't taste like fish - the sprats are just seasoning - a Temptation tastes smooth and creamy with just a tiny hint of the ocean. Many English Jansson Temptation recipes erroneously use anchovies - due to a very common translation mistake. The Swedish word ansjovis is often translated (and understandably so) into the English anchovies, but the fact of the matter is that ansjovis in Swedish actually means pickled sprats. Why Sweden decided to be all rebellious about this subject - and name anchovies sardeller, and pickled sprats ansjovis - we'll never know, but I guess that's how some countries try to stand out from the crowd. Now, you can actually substitute the sprats for matjes herring if you have a hard time finding pickled sprats (and a suprisingly easy time finding matjes herring). My personal tip is to visit that huge Swedish furniture store you might have close by to see if they carry these small salty snorklers. But please stay away from using anchovies. Now, if you don't feel like "Swedifying" your Christmas this year - don't despair. Save the recipe for any cold dark night - Janssons Temptation deserves to be eaten all through the winter, served as it is without any accessories, or together with a few good barbecued bangers. 1.Preheat the oven to 430°F. 2. Slice and cut the onion. Fry it gently in butter until golden. 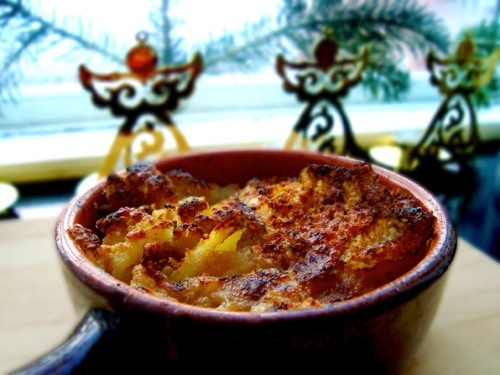 Layer onions, potatoes and finely chopped sprats in a large buttered oven dish (or in several smaller ones like in the picture above). Pour in the cream and about half of the marinade from the sprats. Grind some black pepper on top, spread bread crumbs over the potatoes, and top with a few slices of butter. 3. Bake in the middle of the oven until golden brown, for about 50-60 minutes. Place some aluminum foil on top during the last 10-15 minutes if you think it has gotten too much color. TIP: You can make the Temptation the day before and re-heat it - but if you do, add a little extra cream during re-heating.